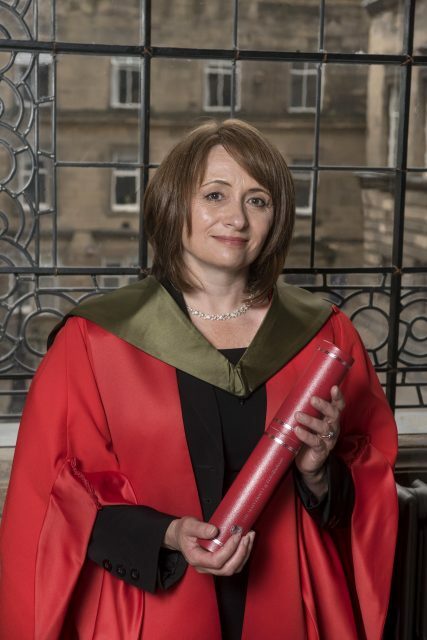 Brown-Forman’s master blender, Rachel Barrie, who works with the BenRiach, Glenglassaugh and The GlenDronach distilleries, has been awarded an honorary doctorate by the University of Edinburgh. Raised in Aberdeenshire, Barrie is one of only a few women to work as a master blender and the first to be awarded an honorary doctorate by the University of Edinburgh. In recognition of her service to the whisky industry, she was made an honorary Doctor of Science at a ceremony on 9 July. Barrie studied chemistry at the University of Edinburgh gaining a First and coming top of her year, before embarking on a career as a research scientist at the Scotch Whisky Research Institute. She later moved to the Glenmorangie Company, part of the LVMH group, working her way up to the title of whisky creator and master blender, before joining Morrison Bowmore distillers, owned by Beam Suntory, where she was master blender from 2010 to 2017. In February 2017 she took up the role of master blender with Brown-Forman. Commenting on her honorary doctorate, Ms Barrie said: “This is one of the proudest moments of my life. My quest has been to unlock a deeper understanding of the distillation, maturation and provenance of Scotch, to develop and nurture richness of character and taste and celebrate it with the world; it’s a great privilege to be recognised in this endeavour. Dr Andrew J. Alexander from the University of Edinburgh School of Chemistry, who awarded the honorary degree, added: “Rachel Barrie’s creativity, sensory perception and mastery of analytical chemistry have undoubtedly widened and deepened the appreciation of Scotch whisky around the globe. The University of Edinburgh is tremendously proud to honour Rachel for her achievements”.